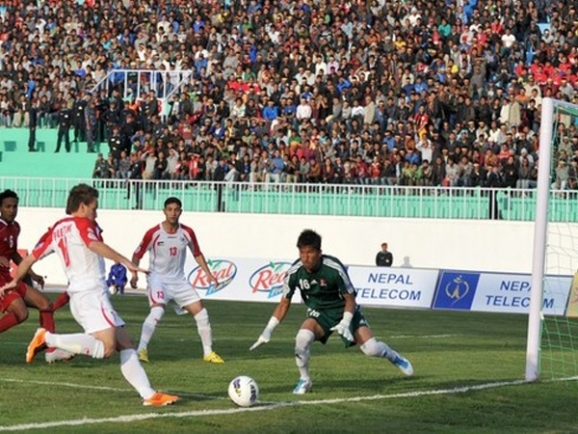 Palestine cooly defeated Nepal in their opening match in front of 20,000 fans packed into the Dasarath Rangasala and were set to ensure passage into the second round today but played out a scoreless draw against Turkmenistan, who were also seeking an instant semi-final ticket. The surprise of the day came when the Maldives shocked Nepal winning 1-0, forcing the hosts into an early exit from the competition. The Ghorkalis put on a spirited, if frustrating, display for the home fans who I must say have been terrific in cheering their team on. Unfortunately a lack of finishing and fatal defensive blunders did them in. Palestine and Turkmenistan go through. A Turkmenistan draw or loss guarantees Palestine the top spot. However if Turkmenistan wins as well, the group leader will be determined by goal difference. Palestine go through; Turkmenistan top the group if they win; A Turkmenistan draw would see the group leader decided by goals scored (currently Turkmenistan has the upper hand); In the unlikely event Nepal hammer Turkmenistan by enough to take their goal difference back to the stoneage (by 4 goals), the Maldives advance in second place along with us. The win for the Maldives would see them through. Palestine's fate would then hang on the result of the other match. Anything other than a Turkmenistan loss would send our boys packing. In this scenario, Palestine would need Turkmenistan to lose by a bigger margin than their own loss if they are to go through. Palestine and Turkmenistan have the best chance of going through on paper. The chance of a Maldives surprise adds a little spice to expectations but I don't see that as a likely outcome. Ideally we would not want to face the stronger of North Korea/Tajikistan in the semis (though of course we can't guarantee that the stronger of them will actually top their group). To be on the safe side, Jamal Mahmoud and company should go all out and try to win against the Maldives by as big a margin as possible. That is easier said than done, the Maldives are no pushovers and will surely give Palestine a hard time especially when they have a semi-final spot at stake themselves. Similarly, in the case of Nepal-Turkmenistan, we shouldn't expect Nepal to hang their boots. The hosts will try to redeem themselves in front of the home fans before bowing out. Everyone has something to play for.